In Nazareth, the Church of the Annunciation (to Mary) stands adjacent to the Church of St. Joseph. Below the Church of the Annunciation, it is believed that the remains of Mary’s family home lie near the believed remains of the home that may have belonged to Joseph’s family – as if to tell the world through archeology that Joseph grew up alongside young Mary as the boy next door. Childhood sweethearts destined to be together. Other traditions tell that the remains in the cave under the Church of St. Joseph are where Joseph had his carpentry business – the holy family either living behind it, or in the home next door where the annunciation to Mary is believed to have taken place. Whether the remains of either edifice are the exact spot where it all happened, Nazareth today tells the story of a unified, devoted family. Even the art on display depicts a happy little three-some: Father Joseph, Mother Mary, and the radiant child ever between them. From icons to sculptures to massive wall paintings, Nazareth portrays the importance of each role. The care needed from a willing mother. The mastery taught from an industrious dad who passed on the family trade and faith to the child he took under his wing to raise as his very own son. Believing the angel’s insistence that the child growing in Mary’s womb was the Spark of the Divine – the son of the Sovereign of the Heavens and Earth, the art of Nazareth shows that between the three – father, mother, and young son – infinite love flows. It’s a good reminder that love has to be learned somewhere. We enter this world as infants with such amazing capacity. When greeted warmly – especially given skin-to-skin contact with our mother in the very first hour after birth, we have the greater ability to attach, have optimal brain development, and avoid separation anxiety which promotes healthy self-regulation as we grow (https://www.medscape.com/viewarticle/806325). Trust develops as we cry out when in need only to find the tender hands of a mother or father responding. When we are held close as babies – able only to see as far as the smiling face gazing back at us, we learn our worth. We know we matter. As we physically grow, our little bodies allow us to explore a great big world that is totally new to us. When encouraged within appropriately safe settings, fear subsides. We learn to delight in the amazing creation all around. Hopefully our homes are filled with kind voices. Reassuring words. The presence of peace in big people who pay attention to us because they really want to – not merely because they feel obligated. Hopefully we’re surrounded by parents and siblings and grandparents too who cheer us on as we develop and are there when we fall to pick us up, dust us off, and love us back into trying again. The lessons of love are meant to start at home. But they don’t stop there. 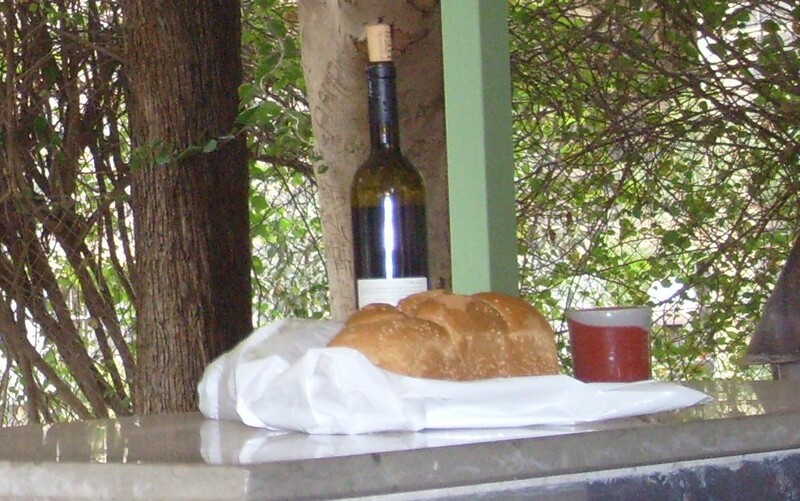 According to the gospel of John, as Jesus is with his followers for their last meal together before his arrest and crucifixion; Jesus repeatedly tells them to love one another. This is the way others will know they belong to him – have been schooled by Rabbi Jesus in his Way. “Love one another,” Jesus persists, “as I have loved you” (John 15:12). . . . It’s such a gift to have the presence of love in our lives. What a joy, even when we are grown, to have those alongside who greet us warmly, and respond to our needs when we cry out, and gaze upon us with a great big genuine smile. Life would be hell on earth without heart-felt encouragement, unmerited kindness, and reassurance that we really do matter – at least to one or two people in this world. Other than saying that no greater love exists than laying down one’s life for one’s friends – and enacting that truth in everything from getting down in the dirt to wash his disciples’ feet to willingly going to his death on a cross, the gospel of John doesn’t give a lot of words to describe love. The Apostle Paul does in his infamous words to the Christians in Corinth when he writes: “Love is patient; love is kind; love is not envious or boastful or arrogant or rude. It does not insist on its own way; it is not irritable or resentful; it does not rejoice in wrongdoing but rejoices in the truth. It bears all things, believes all things, hopes all things, endures all things. Love never ends” (1 Cor. 13:4-8a). No matter what might be going on in the world around; I wonder how many of us enact in our homes, in our lives, in our dealings with each other as a church: patience. Kindness. Lack of envy. No boasting. No arrogance. Never rude. How wonderfully freeing does it feel to be in relationships where it is not about someone always insisting on their way or the highway? Who wants to be around those that are irritable? Who wants to let into their lives the poison of resentfulness? Not even children really like the sibling who’s always excited when they mess up. Wouldn’t we all rather have someone celebrating goodness. Being with us through great challenges – believing in us and hoping the best for us and sticking with us when the rest of the world runs away? . . . Sum it all up in the word L-O-V-E. But don’t forget the texture of love – the key components. The grit of love and the grace. The lasting nature of relationships built upon and filled with mature love. In her new release called Grateful: The Transformative Power of Giving Thanks, Diana Butler Bass eloquently reminds that gratitude, like love, is not just a feeling. It is an ethic, she says. A practice. When chosen routinely, it becomes a habit – which in turn creates a habitat. So: a practice of giving thanks – enacted routinely, leads to a habitat of gratitude – a person who lives thankfully – filled with grace; for they know “every hour is a grace” (Elie Wiesel quote in chapter 2, Grateful). . . . Likewise, a practice of loving – which routinely enacts patience, kindness, humility, modesty, civility, collaboration, contentment, and forgiveness – creates a habitat of love. Beautiful lives for all. Love in action – not just a warm feeling inside. But sustained, chosen acts. Like the kinds we see when the early church was at its best – ensuring those in deep need were tended. Sharing what they had with each other. Speaking the truth in love in trust that God would take care of the rest. Living humbly, with humility – not trying to draw attention unto themselves as they spread the message of God’s love far and wide and accomplished amazing feats by the Holy Spirit. In their finest hours, those Jesus called his friends went forth from his death and resurrection to keep their focus on the transforming love of God for the sake of all the world. Certainly, we know that the practice of love can be complex. Recently, a devoted grandmother was telling me that upon just returning from a week with her daughter and grandchildren, she was trying to determine whether or not to say yes to her daughter’s request to please make the 10-hour car trip again – twice more in the next month for week at a time to again babysit the three grandchildren while their mother worked. I wouldn’t tell the grandmother what to do – how could I? I hardly knew the ins-and-outs of the family’s dynamics even to give good advice. But I was reminded that true love is not always easy. Depending on the situation, sometimes the most loving thing we can do in relationships is tell another person: “No. This is acceptable, loving behavior; and that is not. This is the proper boundary between what is me and what is them. And that is not.” Other times, our yes is exactly what is needed. Freely chosen, we give witness to the kind of love Jesus was commending. “Love one another,” Jesus commands. “As I have loved you” (John 15:12). Live in that amazing flow – the life-giving habitat of acts freely chosen. Practices that are routine so that it takes less effort the more we do them. Schooled in this Way, as Christ promised: great joy will be in all. Indeed, our lives will show infinite love still flows. This entry was posted in Sermons and tagged 1 Corinthians 13, 6 May 2018 sermon, Church Love, Church of St. Joseph, Church of the Annunciation, Diana Butler Bass, Grateful: The Transformative Power of Giving Thanks, Healthy Child Development, John 15:9-17, Love, Love Command, love in families, Love one Another, Nazareth, Practices of Love, The Last Supper on May 8, 2018 by RevJule.